The MSA Filter Self-Rescuers W65-2/W65 and W 95 are Air-Purifying Respi rators for one-time escape use providing protection against toxic carbon monoxide (CO) and other gases emitted in underground mine fires or explosions. The Filter Self-Rescuer is immediately ready-for-use after opening and removal from the container. It has a Latex-free mouthpiece and nose clip to reliably protect the user from the contaminated ambient air. The adjustable head harness allows for a tight fit and hands-free usage. The sturdy stainless steel container is hermeticly sealed, providing long-lasting protection for the respirator. MSA is the most successful manufacturer of filter self-rescuers worldwide. The design and construction of the filter self-rescuer up to the present day is the fruit of the extensive experience gained through MSA's long-standing association with mine rescue worldwide. The CO-filter is an oxidation catalyst which converts the carbon monoxide to carbon dioxide. The catalytic reaction is exothermic - an integral heat exchanger reduces the inhalation air temperature to a tolerable level. The expired air is passed back through the heat exchanger and a spring-loaded exhalation valve into the ambient air. The W 65-2/W 65 is a standard Filter Self-Rescuer, available in shoulder carrying mode (W 65-2) or with integral belt loop (W65/W 65-2 BL). The CO-filter uses the catalyst Hopcalite and a drying agent to retain inhalation air moisture. 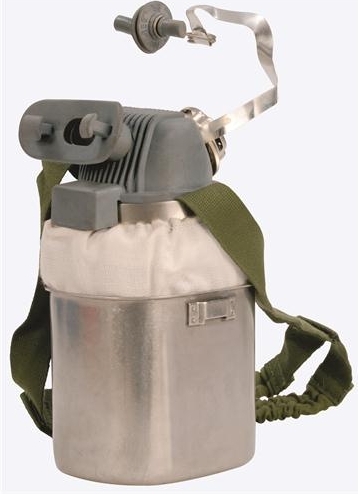 The W95 is a Filter Self-Rescuer designed for extended escape routes, available in shoulder carrying mode (W95) or with integral belt loop (W 95 BL). The CO-filter uses a noble metal catalyst and a Hopcalite pre-filter. This unique combination provides high breathing comfort together with reduced inhalation resistance and temperature. It has a service life of more than 4 hours. Filter Self-Rescuer trainer versions provide simple and economical user training in a non-contaminated atmosphere. After use, they can easily be cleaned, assembled, and used again. For clear identification they are stored in blue containers. The standard model W65-TR simulates size, weight, donning procedure and breathing resistances. The new training device W 95-TR in addition provides inhalation air at temperatures of up to 55 °C for approx. 15 minutes. This permits the trainees to familiarize themselves with the hot dry air typical under emergency conditions. The W95-Trainer is delivered as a "cold air" trainer with an air restrictor to simulate breathing resistance and weight. For "hot air" training the restrictor is simply replaced by the single-use hot air cartridge. 10093137 Hot air cartridge for W95-TR, 6 pcs.